This is a beautiful anthology of sacred liturgical music. Chung coordinates his forces in larger choral pieces with power and vertical balance. 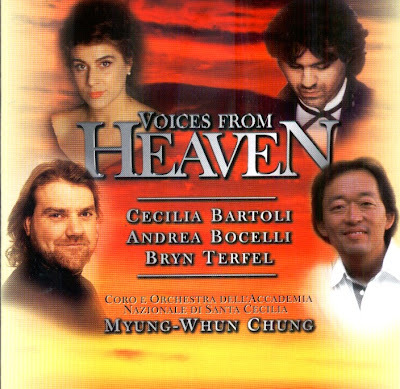 Contributions by Cecilia Bartoli find the mezzo in top form, and Bryn Terfel brings charismatic presence to “Pie Jesu” from the Fauré Requiem. Also included are the interminable "Song for Athene" by John Taverner and a great performance by Andrea Bocelli in Eric Levi's hymn for the world, "I Believe". The CD was released by Deutsche Grammophon, 1998, (DDD). Deutsche Grammophon 459720-2.